Rep. Ilhan Omar (D., Minn.) grew angry with CNN reporter Manu Raju on Wednesday after he repeatedly asked her questions about her latest Twitter controversy. 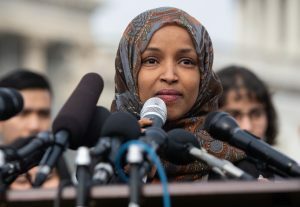 Omar was forced to apologize Monday by Democratic leadership for using anti-Semitic tropes after tweeting that politicians who support Israel are paid off by AIPAC, the pro-Israel lobbying firm. Omar's apology included another knock on AIPAC for having too much influence in politics. President Donald Trump called her apology "lame" and said she should resign or at least be taken off the House Foreign Affairs Committee. According to Raju, Omar first declined to comment on Trump's latest rejoinder. When he saw her again, according to Raju and fellow CNN reporter Kaitlan Collins, she yelled, "Are you serious? What's wrong with you? Yes, I tweeted and there’s a response. You can run that. Have a nice day." CNN showed video of the encounter later in the day. Omar was referencing her tweet in response to Trump's call for her to resign, where she wrote he had "trafficked in hate" his whole life, including against Jews and Muslims. Omar and fellow freshman Rep. Rashida Tlaib (D., Mich.) are the first Muslim women to be elected to Congress. Rep. Ilhan Omar in no mood to talk about her controversies this week. First, she said: "No thank you" when asked to comment on Trump saying she should resign. Second time I saw her, she yelled: "Are you serious?" when I tried to question her. When @mkraju asked Rep. Ilhan Omar about her tweet saying Trump has "trafficked in hate" his whole life, she responded, "Are you serious? What is wrong with you? Yes, I tweeted and there’s a response. You can run that. Have a nice day." Omar previously walked away from Raju last week when he cornered her after remarks she gave at the left-wing Center for American Progress about religious liberty. She spoke to him briefly but then walked off when he asked why she supports the anti-Israel BDS (Boycott, Divestment, and Sanctions) movement. Senate Minority Leader Chuck Schumer (D., N.Y.) has called BDS anti-Semitic. This week's dust-up marked the second time in as many months the freshman congresswoman found herself having to explain caustic remarks regarding Israel; she admitted in January to using "unfortunate" language in a 2012 tweet where she said Israel committed "evil doings" and had "hypnotized the world." However, she initially said she didn't understand why Jewish Americans would be offended by her words. She's also compared Israel to Iran and said the idea Israel is considered a democracy is amusing to her. Updated: 3:57 p.m.: This post has been updated with video.